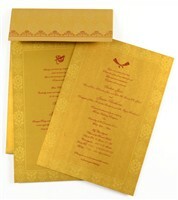 D-4735, Gold Color, Odd Shape Cards, Designer Multifaith Invitations. 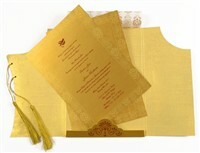 Gold color shimmery paper (240gsm) for Achkan shape card, 2 inserts and mailing envelope. 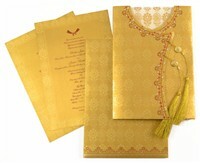 Card inside on light gold self textured paper. Tracing paper overlay on inside.